OGWhatsApp became obsolete or 15 September WhatsApp Expire Error are now solved with GBWhatsApp Working In December which provides you with whole new platform with privacy to Run 2 WhatsApp on Same Android Phone, even fresh install also works. So now one can run Two Whatsapp without Obsolete error. One can also call it as latest OGWhatsApp working. 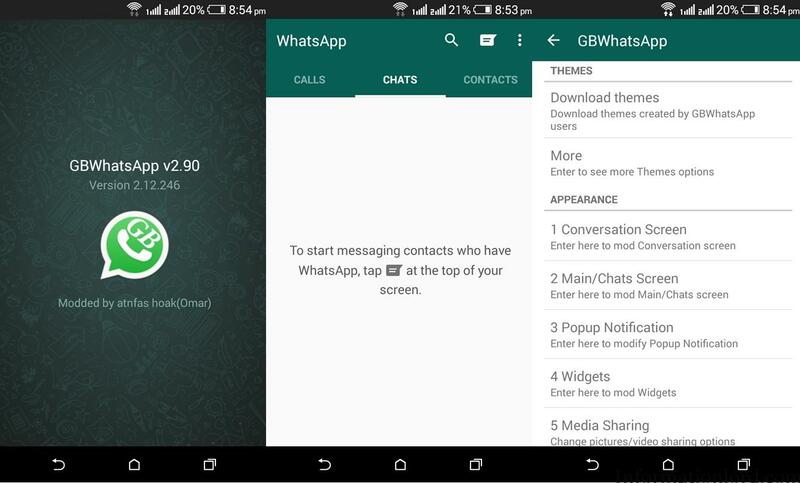 Download and Install latest GBWhatsApp working in May 2016 from here. Install GBWhatsApp as normal APK. Once installed, simply open GBWhatsApp and activate another number using GBWhatsApp and thereby you will receive your activation message. If you want to restore your data. Then simply tap on restore while you open GbWhatsApp for the first time. If you are struck anywhere while following GBWhatsApp – 2 WhatsApp on Same Phone then feel free to comment! Please show us your love by sharing this article to maximum. Hope it has helped you! Thank You! Why it shows error when I apply a theme ??? We are working on new mod so that you will not face any problem. I don’t know y but I can’t restore my chats from my old official WhatsApp… It doesn’t restores at all…. I have WhatsappGB in my mobile i want to keep the “Always Online” feature on but i’m unable to do that as i lock my screen i get offline what do i do any advise? Hello please help me my GB whatsapp is expiring tomorrow but it has failed to up date. there giving me down loader. Please try the same with latest version! Did you check by renaming the folders! And making sure that you have the latest GBWhatsApp? tried to store in google drive but not restored. can any one solve this problem ? Rename the folders of GBWhatsapp to Original WhatsApp,which will help you! Try reinstalling the GBWhatsapp on your LG G5! That should solve your problem! Hope it is clear! Enjoy ! Hi could you please help me with this i bought a new iPhone so now I need my conversation to be moved into it from Android phone where I am using gbwhatsapp please give me some solution……. You can try this: First Change GBWhatsApp Directory with name of WhatsApp and then on Android Phone Activate Original WhatsApp and let it restore Data from Local storage and after that Once Data is Restored on Original WhatsApp then take the backup on Google Drive! This will solve your problem, Now simply restore everything on your iPhone using Google Drive! Hope it helped! But then you do not have GBWhatsApp for iPHone! Therefore No use! Try the one I just described! But now you have inspired me to dedicate a whole post for this! You will shortly see the tutorial to Restore Chat from Android to Iphone! Can you please specify as to what the issue is! Please Try Redownloading the same! Ji, had downloaded gbwhatsapp and it started working fine but the photos and videos were not coming on clicking while it was showing copy link etc. So I uninstalled it.. .. can you please guide on to resolve such issue. Make sure that you are using latest GBWhatsapp Updated one! When I try to restore backup via google. You can disable your data when you come to this step to access account! Well try to update to latest GBWhatsapp using the inAPP Popup instead of manually downloading the same! this will fix your problem from now on! Link is now updated from November Bro! Please Check! Link is updated! Please recheck! Hi Somesh, I have been using the GBWhatsapp alongside the original whatsapp app. An update message popped up on the GBWhatsapp which I tried to download. I tried installing it n they keep telling me I already have the app installed. Now I uninstalled it n tried installing the latest apk version n I still get that failed to install message. Out of frustration, I uninstalled the original whatsapp too, after which I installed the GBWhatsapp which was successful. Now trying to install the original n I keep facing same problem. Pls help. Make Sure that you delete the earlier folder of GBWhatsapp after taking a backup for the same! And then try installing the New Updated GBWhatsapp! Use GBWhatsApp, then Use Parallel Space app and with this you will be able to use 3 WhatsApp on Same android phone! Thank YOU! Well, then you should install it normally! Thanks! First do a Fresh Install of GBWhatsApp and When it asks for Restore Backup! At that point of time Turn Off Your Mobile Data and hence your problem will be solved! Hi, when I tried to restore my messages from the original WhatsApp to GBWhatsapp, it asks permission to open google drive and then asks me to choose an email. After I chose an email it says cannot access account. Any solution? I’ve tried so many things. When it says to Restore Data! Simply Turn Off Wifi or Mobile Data! So that no such problem appears! Well this is for Android not for Ios! One can look over to https://dualwhatsapp.net for latest GBWhatsApp Update! The Link is now updated! Please check the same! Thank You! Hi Somesh…now this updated version become obsolete now… Request you to plzz provide an update… It became obsolete today…. It is now updated! thank u! The link is updated! Thank you for your patience! I uninstalled my whatsapp to install gbwhatsapp which went through fine but the BIG trouble here is that my play store recognises gbwhatsapp as the original whtatssapp and therefore I am not able to reinstall whatsapp. It is kind of allowing me only to have either of the app and not both. Uninstall both the whatsapp first and then install original whatsapp and thereafter install the latest GBWhatsApp and your problem will be solved! Thank You! Well the updated version link is already provided in the article! ThankU! I hv dwnload gbwhatsapp bt create on issue … the app required update …so pls help ? Please use chrome to see the Download link! Thank U! What is the purpose of open log in gbsettings? It gives you all the error reports and details about what all you have done on GBWhatsApp! Try Uninstalling WhatsApp and then Installing it! Thank U! For now we only have GB WhatsApp working fine! For this method! You need not to follow the old procedure! here you can directly do that! I guess that will bleach privacy of users! Well few users did the same! And yes that works too! Well, lets see if i could manage to do this! If yes! then soon we will have the tutorial to Use same whatsApp on two different phones! Thats because GBWhatsapp is not Official Whatsapp application! Which is creating a conflict! Try using Google Chrome to download it! it is really works on me…thanks man..
That means your download was incomplete! So please try again! Yea, but there was no need of it! Until others expired on 15th!